Saturday, 31st May 2014, at Sywell Aerodrome. AeroExpo UK will be putting on the first Aviation Fashion show at this year’s event, showcasing different Aviation brands and the latest trends in the Aviation Industry. 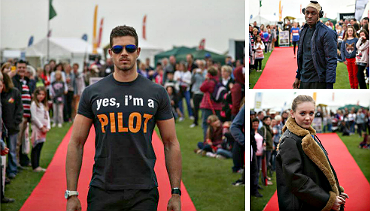 From pilots clothing to casual wear to the latest accessories, professional models will be walking down the red carpet for all attendees to view and be a part of. With thanks to all the brands participating to help make this Fashion show successful and fun we are confident that it will be a blast for everybody watching. We hope to inspire Aviation clothing brands to keep promoting and design trendy outfits for pilots and aviation enthusiasts as the Yachting and Polo Equestrian industry have done in their communities. A dedicated team has been assigned in preparation of this year’s fashion show to ensure full enjoyment for the entire family and attendees at AeroExpo UK on Saturday afternoon.